Featured CrossFit Preferred Couple – Amy & Jason Hunsaker! CFP Bowling Night! Next Friday! CrossFit Open Starts February 21st! CrossFit Preferred Committed Club 2019! Welcome New Members and Grads! Meet Amy and Jason Hunsaker! They are one of our power couples at CrossFit Preferred! One of their favorite parts of CrossFit is the sense of accomplishment it gives them each time they come in! It has taught them that they can do way harder workouts than they ever thought they have. They have also found that it transfers to their everyday life. They both support each other in and out of the gym! They have found that doing tough workouts together has made their relationship stronger. They said that there are so many days when they get home that they are still talking about the workout that they just completed! They love celebrating the workouts that they do together! They workout with the evening crew at CrossFit Preferred and they shared that besides getting to work first thing in the morning the gym is their top priority! They pack their bags the night before they go to work and are ready to go to the gym right after work. They do not let themselves get comfortable before they come into the gym. They make exercise a high priority and they have found that taking care of themselves makes a huge difference in their day to day life! They have found that their closest friends like many of us at CrossFit Preferred are the people that they workout with each day. In the last year the they have put a huge focus on nutrition and have been amazed by the results. They have both lost weight and have gained lean muscle. It has helped them to feel more confident and reach fitness goals at the gym. Their lifts and many other disciplines are improving and continue to improve! Amy works for the City of Chandler in the Prosecutor’s office. Jason works as a Detective for The City of Chandler Police Department. They both met through work. I train to stave off the heart disease that runs rampant in my family…and also because I really love the hard work. Why do you do train at our gym? I was hooked after the first on-ramp…even though I really thought I might puke. What were you most afraid of when you first joined our gym? I don’t recall being nervous about much when we first started (besides the “let’s go around the room and introduce ourselves” nonsense. My fellow introverts get it). What one thing got you to take the initial leap and sign up? It was such a welcoming and encouraging atmosphere for someone who had never heard of CrossFit before! What were your goals when you first started? When I first started, my goals were to simply survive the workouts and figure out what all the terms meant! That evolved into trying to get my first pull up, which evolved into trying to lift heavier, which evolved into trying to RX most workouts. So much fun! What is most important to you in your life right now? The most important thing in my life right now (and always will be) my relationship with my husband, Jason, and our three kids. Jason and I have been best friends since the day we met, over 20 years ago. We met at work, and all these years later we’re still working together, inside AND outside the gym. We tell people we’ve been partners in crime since 1999 – people who know us get the joke. My biggest challenge right now is trying to get the family together regularly! We have 3 adult kids all going in different directions with school and work and, well, life, so maintaining those relationships is super important. Well it initially started out as trying to just get in shape and lose some weight but now, since coming here it’s to, i guess just to improve every aspect of my life and right now it’s to, I’ve discovered things iv’e never been able to do before, and I want to keep being able to do things that I’ve never done before, and it really does bleed over into my regular life as well because I know when I get through hard things here I can get through hard things there, and it just prepares me for all aspects of life, so yeah it’s grown from trying to get in shape to this is preparation for all parts of your life. I had this idea that CrossFit was for super Elite athletes and that was not me, and still isn’t me (laughing), so that was intimidating. Just my preconceived ideas about what CrossFit entailed. And then coming here blew that idea out of the water completely. That I would have to attribute to my wife. She really is a driving force behind uh, I am kind of a reluctant guy to try new things, but Amy always is ready to try new stuff. In fact her friend Amy Benton (member of ours) kept telling her about it and telling her about it and so we thought all right lets give it a shot. (Kris – I forget how you guys know Amy Benton) So Amy and Amy go to church together. So she was always talking about it and even before she said come out and try it she would talk about it and say ” Oh yeah I did this today and I did that today and I PR’d my deadlift” all of these really cool accomplishments that now that we have experienced them also it’s a HUGE motivator to be like holy cow look what I did and what else can I do. I think my first goal was probably just weight loss, I would say that was the first big motivator. But since then it has transformed into what new skills can I do, what new lifts can I do, and lately since we have been doing the barbell ninja stuff, the olympic lifting is just SUPER cool! Now it’s keeping the upward trajectory and seeing what new accomplishments I can make. There is still some body transformation I can do, but I can see some major results since I have been here and thats a huge motivator since I’ve been here and now I just want to keep getting better at the olympic weight lifts and all the skills really, There are just so many skills. I guess that’s the thing, there is just never an end. When you think you got, Oh man I can do this now, you say oh but I’m week here, here and here and I could do this better and better. There is just always something to keep working on. And I think the more you go the more you realize how much farther you can go and have to go. It’s never boring and you never get to the end and think ok now what. My relationship with my wife. Straight up truth, and this isn’t a cliche plug or anything but this is one of the things we do together ALL the time, and our relationship I think has gotten stronger, not that there was any issues but when we do these hard things together we do these things as a team it does nothing but straighten the bond that we got. So doing these things with Amy, I don’t want to sound like the gym rat cause I’m not but we kind of work and do all these other things so that we can come here and come to the gym together. And we can do this and it is a cycle because now that we can do this we can do all these other things together, but yeah my relationship with her is priority number one and this aspect or this component of our lives together does nothing but build that. I don’t want to say my life is comfortably on autopilot but you know I think for me probably as someone who likes to plan out every detail of something that could possibly be planned and make sure all bases are covered and everything is going to be something which is just something you can’t do in life that is the biggest struggle for me. Just being able to accept the randomness of life and deal with the punches as they come. And I will make another plug for doing CrossFit it kind of preps you for that too cause you never know whats going to happen, and when your in the middle of it you are thinking man can I even get through this and then you just keep doing the next step and the next rep and the next movement and you get it done and you get through. So yeah the unexpected i guess are the things I don’t particularly care for. But yeah there are so many wonderful metaphors and practicalities for life by coming to CrossFit. We are so proud of you Amy and Jason! You are both such a great part of CrossFit Preferred! We are so excited for our first CrossFit Preferred Bowling Night! Where: We will be bowling at Fat Cats (Southwest Corner of Baseline & Greenfield) ! We will cover the lanes and some food and drinks! It is going to be a blast! You do not want to miss this night! There will be serious FOMO! The 2018 CrossFit Preferred Friday Night Lights Winning Team! We are so excited for the CrossFit Open to start! For those that have not participated before it is such a great time!! It is for everyone regardless of your fitness level. The Open will bring you up a level! This is where grassroots meets greatness: Compete with hundreds of thousands of athletes in CrossFit’s largest all-inclusive event. Stay tuned to see who wins our January Committed Club prizes! We will be drawing a winner who attended more than 15 times in the month of January for our first Committed Club Prize!! We will be raffling 1 $50 Gift Certificate to CrossFit Preferred to be used on our products (Driven Nutrition, Perfect Bars, Fit Aid, Rehband, etc.)! We will be announcing next week in our Facebook Live on Wednesday at 12:00pm! We are on week 5 of our 8 week Healthy Habits Nutrition Challenge. It has been so great to see so many members of the gym make an effort to improve their overall fitness. I am starting to see the physical change in many of our members participating. Many of you are hitting a personal weight you haven’t seen in years. So many others are improving on pull-ups, toes to bar and even setting new PR’s in running all because you are lighter on your feet. HUGE congratulations goes out to all of you participating in this challenge! Even those that aren’t participating in the Nutrition Challenge are welcome to follow the 9 Healthy Habits we are all following. I know that by following these guidelines you will start to see changes in your body composition and will feel more motivated in the gym. We only have 3 1/2 weeks left of this Challenge. For all of you that get perfect points this week (including the 5 bonus points for checking in on Facebook each time you come in) you will receive a sweet CFP swag bag! Lets all push hard to get the most out of the Nutrition Challenge!! If any of these topics resonate with you please jump on and ask us any questions you might have. If not join us anyway 🙂 You will make it more fun! If you are not able to watch us LIVE we will be posting the show to our Facebook Page as well as our private members group for you to watch at your convenience. Congratulations to Joel Stepanek for passing the CrossFit Preferred Gray Level Test and White Level Test last month! He crushed both tests! He passed the Gray Level then went on and passed the White Level with 110%. You need a 80% score to pass the White Level Test! We have 4 level tests! We have the Level 1 Gray Test, Level 2 White Test, Level 3 Red Test and the Level 4 Black Level Test that only 17 have ever completed! We now test the first Saturday of each month! For each level that you pass you get a shirt the color of the test! Come earn your shirt and LEVEL UP at CrossFit Preferred! PLEASE SIGN UP WITH A COACH TO SCHEDULE YOUR TEST TIME! Join the CrossFit Preferred Team for the Spartan Sprint Race February 9th at 10:30am! We have a great team and it is going to be such a fun time! If you CrossFit you can Spartan Race! The next race is at the Cardinals Football Stadium Saturday June 15th, 2019! Training for a Spartan Race will push you in your training! Fundamentals Grads – Congratulations On Finishing Fundamentals! Returning Members – Welcome Back! CFP Member Anniversaries for February! 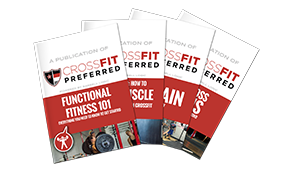 Thank you all so much for being a part of CrossFit Preferred! You help make CrossFit Preferred a great place for all of us!